o Senate District 26 (San Antonio): Leticia Van de Putte is leaving to run for mayor of San Antonio. o House District 17 (central Texas; includes Lee, Bastrop, and Caldwell counties): Rep. Tim Kleinschmidt is leaving to serve as general counsel for the Texas Department of Agriculture. o House District 123 (San Antonio): Mike Villarreal is also running for mayor of San Antonio. Candidates for all three seats must file applications with the Secretary of State no later than 5:00 p.m. on Monday, December 22, 2014. Early voting begins Monday, December 29, 2014. The 2015 Inaugural Committee, responsible for overseeing inauguration festivities for Governor-elect Greg Abbott and Lt. Governor-elect Dan Patrick, has been announced. Ardon Moore of Fort Worth will chair the committee, with Alejandra de la Vega Foster of El Paso and Toni Brinker Pickens of Dallas serving as co-chairs. Inauguration Day is January 20, 2015. Texas A&M University, the alma mater of outgoing governor Rick Perry, may rename its 100 year-old “Academic Building” the “Governor Rick Perry ’72 Building.” The Board of Regents meets Thursday to vote on the proposal. Only in Austin… A truly Austin holiday tradition is to decorate a cedar tree along Loop 360. No one knows how this all got started, but the tale is that it began with just one family decorating a single tree. The number of decorated trees grows each year. 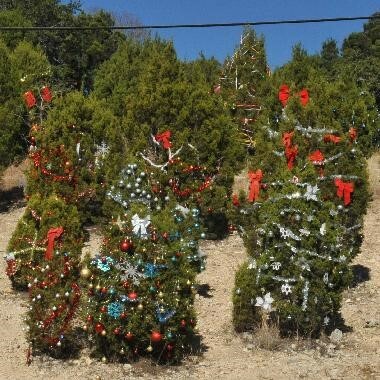 If you decide to go decorate a tree on Loop 360, don’t forget to un-decorate it after the New Year!